A New Action-Packed Trailer For Dauntless | Nerd Much? The artwork is almost as smooth as the animation (which still has a few hiccups in the trailer) with very bright colors on both player characters and the world itself. Everything from the grass to the rocky cliffs in the background are stylized to be crisp and clean. 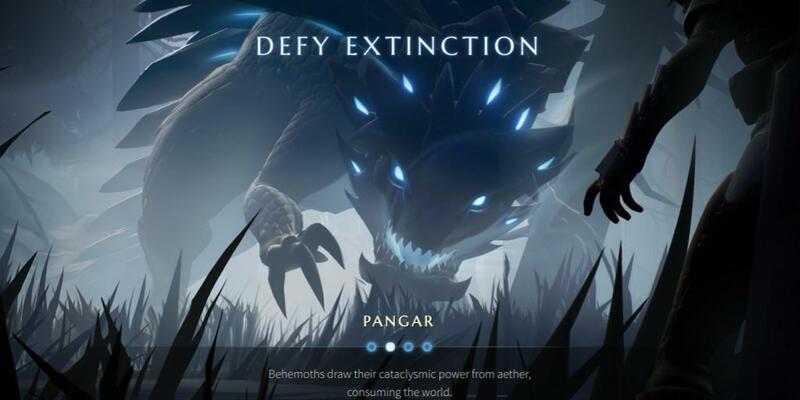 That’s nothing to say about the monsters, which are called Behemoths in Dauntless, whose design is very creative, from the physical look of them, to the unique attacks of each. My personal favourite is the Pangar, and his rolling ice-attack. It’s almost distraction enough that I’d probably forget to dodge! In addition, the developers at Phoenix Labs have written a detailed bestiary on Pangar that I hope makes it to the main game. What do you think of Dauntless? Will you be signing up for the beta after seeing this new trailer? Let us know in the comments below!